Is taking to the streets the way to fight corruption? The unexpected election victory in Delhi for the anticorruption Party of the Common Man (Aam Aadmi Party, AAP) and the short-lived tenure of party leader Arvind Kejriwal at his post as Chief Minister is a cautionary tale, and not just for India, but for all countries facing similar problems. It hardly needs to be said that corruption is an absolute evil and must be fought with all available and effective means. This includes stepping up law enforcement, improving economic incentives, and turning public opinion against any manifestations of corruption. The only thing that will not overcome corruption is splashy, but completely empty political statements. It seems that Anna Hazare, who started leading the campaign against corruption in 2011 in India, understood that very well. In any case, he said from the very beginning that he would not turn his movement into a political party, apparently trying not to gain any benefit for himself, but staying in the midst of civil society to influence public opinion and help mold attitudes. However, Arvind Kejriwal, one of the closest associates of Anna Hazare, quickly realized that it would be easy to make a political career on the wave of the anti-corruption campaign. Making a break with his former guru, he started a party with a very savvy sounding name. It's not only the party of “the common man”, its abbreviation sounds like the word for "you" in Hindi. By doing this, he made it clear to potential voters that he was going to defend them, and not his own personal interests. The voters apparently believed Kejriwal and in the elections in Delhi at the end of last year, AAP unexpectedly came in second. 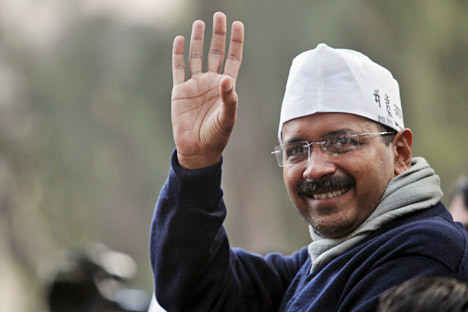 Enlisting support from the roundly defeated Indian National Congress (i.e., the same authorities that Kejriwal had so fiercely criticized during the campaign), AAP formed the Delhi government, and Kejriwal himself became Chief Minister. Usually the successes and failures of newly elected officials are discussed one hundred days after they come to power. Kejriwal didn't have a chance for that. Even after becoming the Chief Minister, and receiving rather wide-ranging authority, he continued the struggle to reach his goals not in a way befitting a representative of authority, but as a populist politician that wants to appeal to the sentiment on the street. He got into serious disputes with the Ministry of Internal Affairs and the Delhi Police. Rather than conducting a careful and patient process whose results would not have been immediately apparent, he again called for high-profile political events like a sit in, which for a few days actually paralyzed transportation in the city that had been entrusted to the new Chief Minister. In the end, when Kejriwal failed to convince the deputies of the Legislative Assembly to adopt the Citizen's Ombudsman bill (Jan Lokpal bill), in line with the logic of the street, he resigned from his post in protest. And it happened not even one hundred days after he came to power, but only 49. In fact, the story is quite revealing. After all, many countries similar to India in terms of economic development and social order face the problem of corruption. And in some cases, attempts by corrupt politicians and bureaucrats to exploit the justifiable indignation of the people do not end as laughably as they did in Delhi. Russia was at a similar stage of development in the 1990s after the collapse of the USSR. In the last years of the Soviet regime, almost everyone was very frustrated with the level of corruption, which the public associated with the monopoly of the Communist party. Against this backdrop, the star of the main criticism of the corrupt system was Boris Yeltsin. However, after Yeltsin was established as Russian President, much more cynical and unprincipled leaders grabbed the real power. It's no coincidence that this period of Russian history has been named the “raucous 90's.” We're not just talking about the rampant crime. The most important thing was that in those days, the so-called oligarchs took up all of the power in the country in their hands, and the new democratic ministers brought corruption to a level never dreamed of by their Communist predecessors. However, the raucous 90's did play a positive role later. When the well-known blogger Navalny (who, by the way, had also gotten his hands dirty) decided to play the corruption card for his own PR in 2011-2012, few people in Russia believed him. He performed poorly in the 2013 mayoral race in Moscow, receiving about a quarter of the votes. But our neighbours in Ukraine have played the corruption card full tilt. Even though the accusations against the ruling regime were completely legitimate, the opposition decided to achieve their goals through street demonstrations. The results are clear - an illegal coup, semi-fascist forces coming to power and bringing the country to the brink of civil war. Against this backdrop, we don't even need to mention the infamous Arab Spring, where legitimate discontent with corrupt authoritarian regimes has resulted in rampant violence and terrorism. So, maybe, the show staged by Arvind Kejriwal and his inglorious tenure as Chief Minister of Delhi wasn't the worst outcome for India.